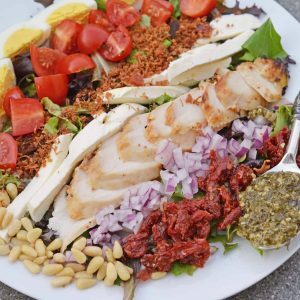 This Cobb salad recipe brings together so many amazing ingredients onto one plate! 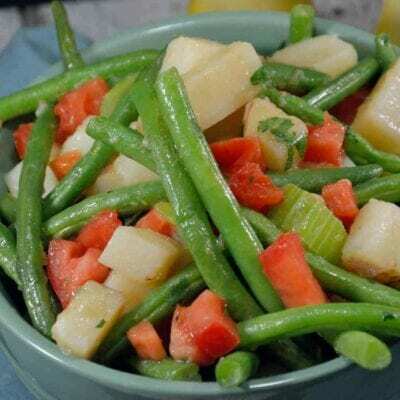 If you’ve been searching for a delicious salad recipe, be sure to give this one a try! 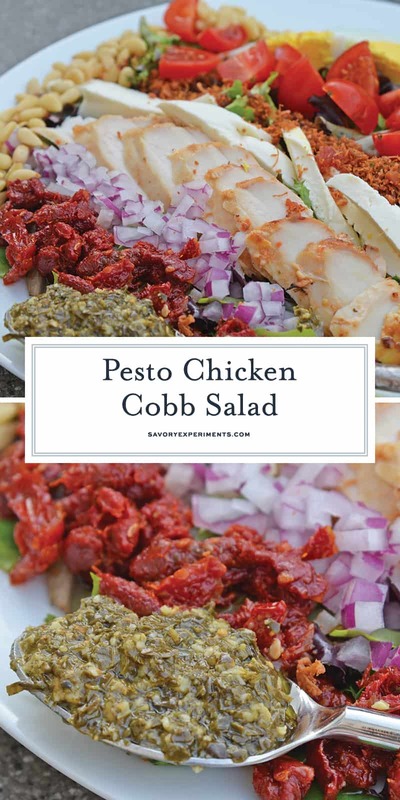 Pesto Chicken Cobb Salad is a delicious salad recipe using traditional Cobb ingredients with chicken and a pesto dressing. 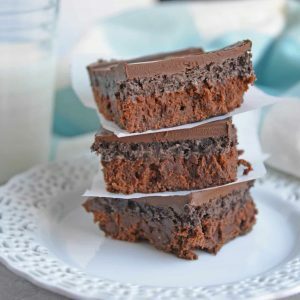 The perfect starter or entree! What is a cobb salad? Remember this acronym: EAT COBB, and you will be able to remember the cobb salad ingredients. Egg, Avocado, Tomato, Chicken, Onion, Bacon, Blue cheese. The Cobb salad originated at the Brown Derby in Hollywood, California and was named after its owner. 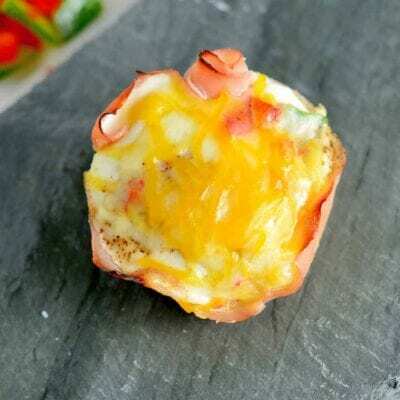 Now days the Cobb has many variations, Pesto Chicken Cobb is just one, but also my favorite. My Italian Cobb salad uses a few different ingredients. Instead of blue cheese, I use fresh mozzarella. Tomato is both fresh and zesty sun dried, I nixed the avocado, but feel free to add it back in. 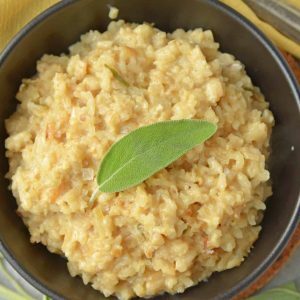 For the buttery flavor, I added toasted pine nuts. And the salad mix is spinach and arugula, but if that doesn’t fit your fancy, use any type of leafy green. If you have the time, I suggest you marinate your chicken overnight for more flavor. If you really can’t, make sure you marinate for at least 1 hour minimum so you still get some of the Italian dressing flavors. 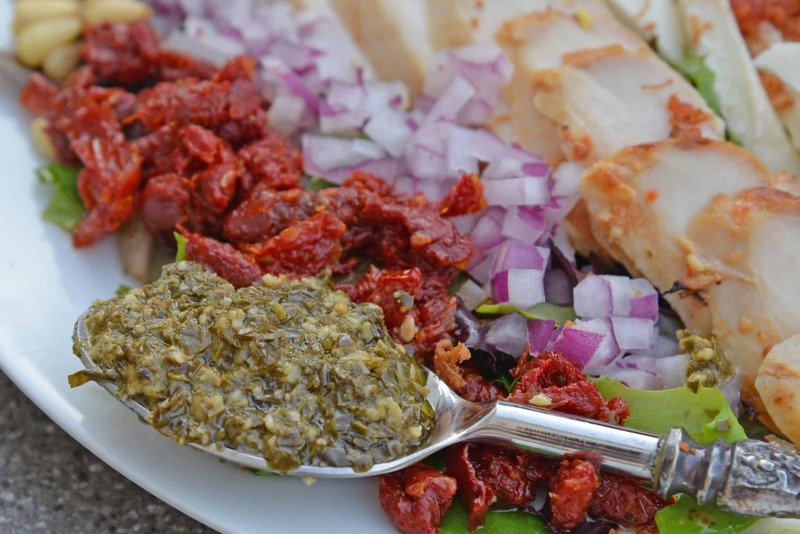 The pesto sauce does have a ton of flavor and will compensate for lack of flavor if you don’t have time to marinate. Make your own pesto or buy some at the store, whatever is easier. 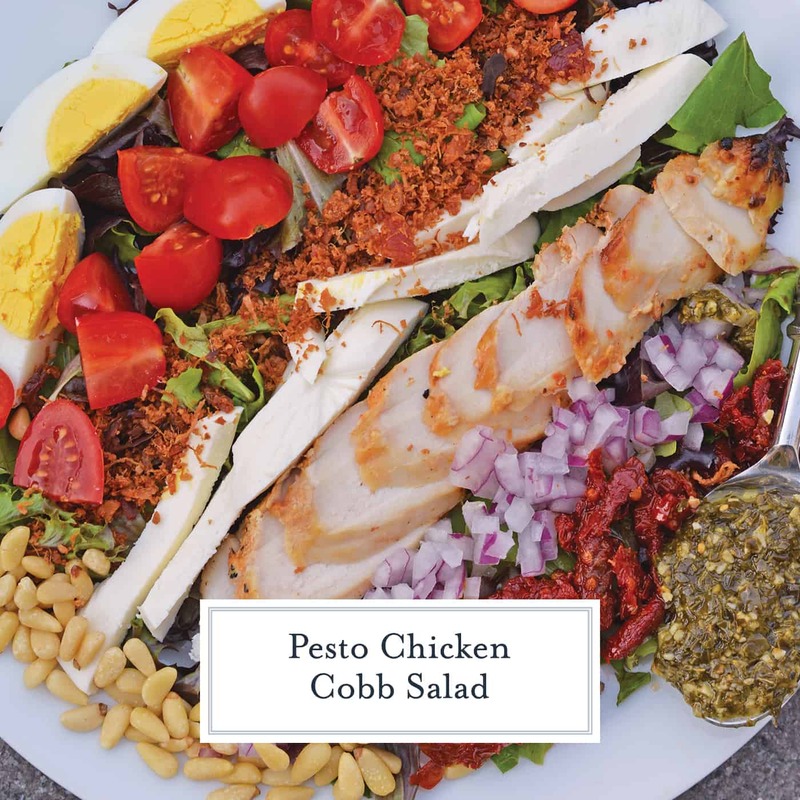 Don’t worry about taste, this Pesto Chicken Cobb Salad is like a flavor explosion in your mouth! Make sure you check out my 7 tips for more interesting salads before you starting chopping! Marinate chicken in Italian dressing for a minimum of 1 hour or a maximum of overnight, refrigerated. Heat a medium skillet over medium-high heat. Coat with cooking spray. Cook chicken on each side for 5-8 minutes, or until chicken is done. Discard extra Italian dressing. Remove to a cutting board and thinly slice against the grain. Divide spinach and arugula mix between two large bowls. 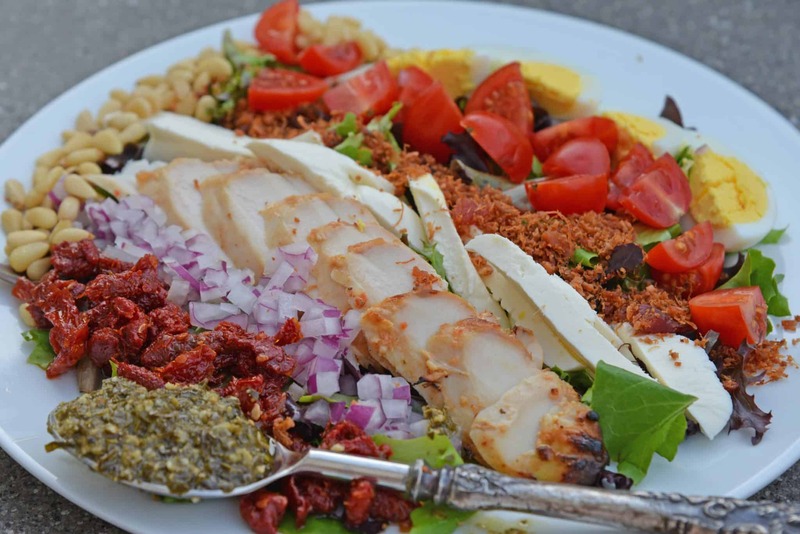 Carefully arrange toppings, pine nuts, quartered hard boiled eggs, sun dried tomatoes, fresh tomatoes, mozzarella cheese, red onion and bacon, in strips on top of greens. 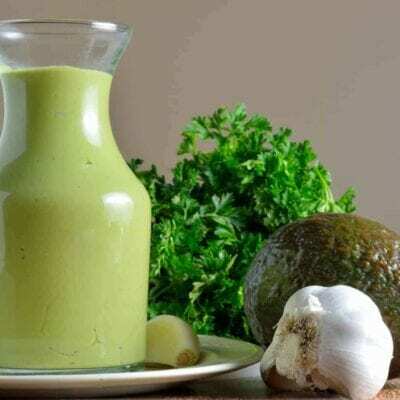 Serve with 1/4 cup pesto on the side as dressing. 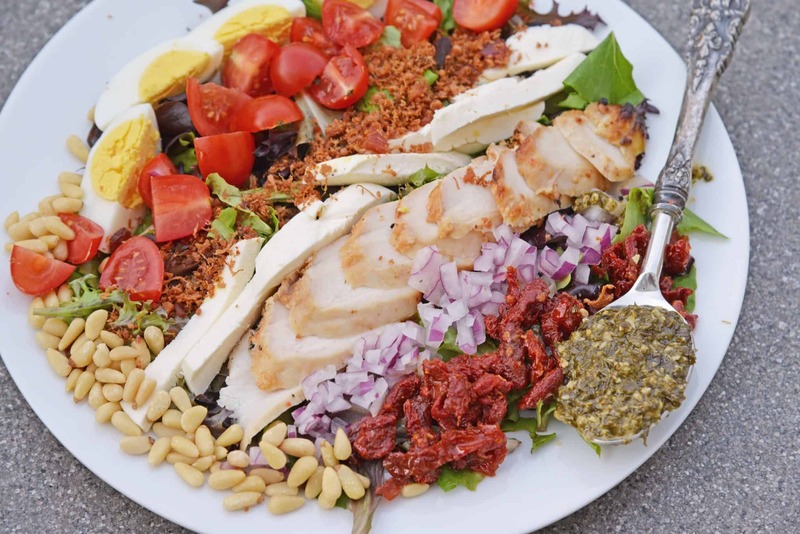 Enjoy your Pesto Chicken "Cobb" Salad!